As predicted, we were in London(Derry) within the hour. David offered us an optional walking tour for 4 pounds each–which all of us on the bus decided to take. He then introduced us to Rory, a radical Catholic, who took us through the walls of Derry towards the ‘Bogside’, the area that was ravaged by the religious turmoil that shattered Northern Ireland in the 1970s. David had laid the foundation for us on the bus, telling us about the troubled history of Ireland from the 1916 Easter Rebellion in Dublin to the 70’s when Bloody Sunday led to the rebellion and the founding of the IRA or Irish Republican Army with strong Catholic ties and a determination to free Ireland of the British yoke. Since a picture is worth a thousand words, Rory took us towards the many murals that remember the tragedies of that period and the courageous men and women who gave up their lives fighting for what they believed to be a just cause. As someone who can trace his family lineage to centuries in Northern Ireland, long before the English took control of the island, Rory is fiercely proud of his heritage and refuses to recongize the control of the English crown over his beloved land. He told us that as far as the IRA is concerned, though labelled terrorists and militants and guerillas, they are merely fighting for what they believe to be their birthright–an Ireland free of the English. We paused by Celtic crosses with verses penned in Gaellic that recall the sacrifices of these young men and the passion that led them to their goals and their deaths. Of course, we received only one side of the debate from Rory, and, no doubt, I would receive the Protestant version from another equally impassioned fighter before I got out of Ireland. But in his retelling of the tragedies of that period, I received an insight into the history of a people and a country that has laid a pall of gloom over the culture. Indeed, it amazes me that in the midst of their multiple losses and suffering, the Irish people still find the joy in their lives to indulge their love of music, dance, drink and merriment. 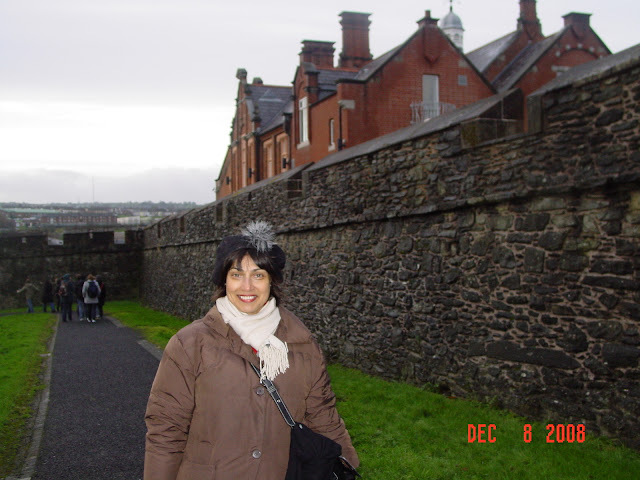 Derry is an extraordinary city perched upon a mountain that is enclosed by walls that were built in the 1600s. It is divided by the River Foyle that cuts through the Protestant and Catholic parts forming a natural line of division to keep the warring factions at bay. With my mind still wrapped around the strife, I arrived at a large public church yard where a recent X-Factor star called Owen made an appearance, much to the thrill of pre-teen girls who had arrived there to catch a glimpse opf him. It is manic, this power of reality TV and the reations it can induce. By 4. 30, we were bidding goodbye to Rory, then boarding our Paddywagon to head towards Belfast where we arrived after darkness had fallen. It was a long ride but a very pleasant one indeed. I noticed that there is little in terms of the countryside to distinguish Northern Ireland from the Republic of Ireland further south. They can both boast incredibly beautiful countryside that is unspoiled by human development, a slow pastoral lifestyle that is characterized by good music and loads of good stout. It was to experience some of this that I headed to Robinson’s Bar, one of the most famous Belfast pubs with Marina, an Italian from Ancona, and as we chatted over a cold cider, I realized how enlightened I had become by my visit to Northern Ireland. Our travels in the Republic of Ireland, a few years ago, while introducing us to the bloody uprising of 1916 on O’Connell Street at Dublin’s Post Office, had not prepared us for the immediate encounter I had with more recent strife in the Northern part of the country. As Belfast attempts to rise up, phoenix-like, from the ashes of her troubled past, I could only hope that the Peace Agreement, however tenuous it may now seem, will be a long-lasting one, and that the country may enjoy the same lightness of spirit that is so easily evident down south. 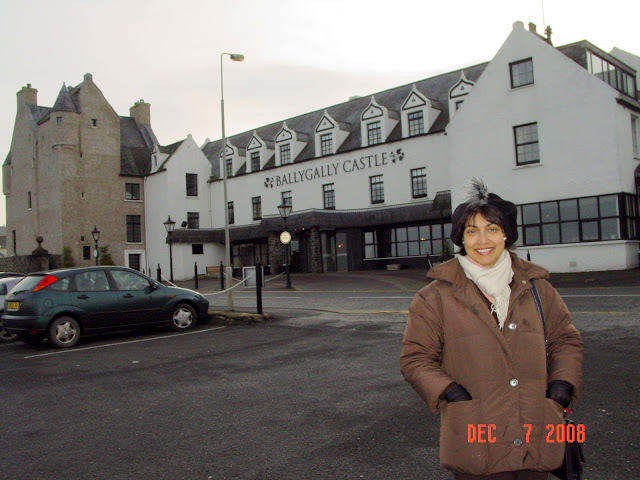 This entry was posted on April 12, 2006, in Bon Voyage!, Europe, North Ireland. Paddywagon runs day tours to the Giant’s Causeway on the North Atlantic shore of Ireland–a must-do trip for anyone who visits Belfast, even if briefly. Several companies run this tour but Paddywagon was different in that it did not follow the scenic coastal route but went inland to the Giant’s Causeway and from there traveled further west to Londonderry or simply Derry as the Catholics call it. Since I was keen to see as much of Northern Ireland as I could, I opted for Paddywagon. This meant awaking at the crack of dawn to walk to a neighboring hostel on Lisburn Road to pick up the coach at 8. 30 am. I bought a croissant and a take-away coffee and set off, found our driver/guide David and a bunch of other young folk brave enough to visit Belfast in the heart of winter. By the time we set off from the city, it was about 9. 30 am. As we passed through the urban midst of Belfast, David pointed out buildings of particular interest. Before long, we were coasting out of the city and on to the highway, passing by Cave Hill, which had been the inspiration for Jonathan Swift’s Gulliver’s Travels. The profile of the hill does look suspiciously like a giant sleeping on his back. When viewed against the dockyards of Harland and Woolf, the many men rushing back and forth all day appeared to be running across the giant’s face and stomach. This provided the image for Gulliver in the Land of the Lilliputs and led to the 18th century novel that sealed Swift’s reputation. An hour later, we arrived at one of Northern Ireland’s best-known attractions, the Carrick-A-Rede Rope Bridge which is simply a swinging cable bridge that connects the mainland to a small salmon fishing island. To get to the island, visitors cross the bridge, one at a time. This wobbles dangerously about 70 feet above the sea and is not for the faint hearted. I doubt I would have given it a shot, but at any rate, I wasn’t allowed to find out as the bridge is closed in the off-season. Perched high above the cliffs, we received a good view of it as well as the distant shores of Scotland (the Mull of Kintyre was clearly visible when the fog lifted) just behind Rathlin Island to which ferries sail in the summer. The sheer isolation of this venue was deeply striking espeically when viewed against the emerald-green of the dales that sloped down softly to the seas. 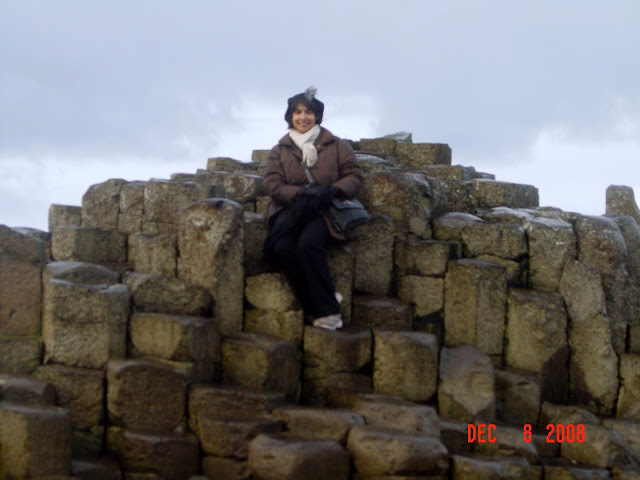 About half an hour later, past marvelous rural countryside, dotted liberally with black-faced sheep, we arrived at the Giant’s Causeway about which I had heard so much when I was researching a visit to the Republic of Ireland about five years ago. David told us about a restaurant called The Nook that served really good traditional Irish fare and as I was keen to taste some of it, he took orders from all of us. He recommended the Irish Stew strongly but the Steak and Ginnness Pie even more warmly–so I opted for that. We were given an hour at the Causeway and were told to return at noon to the restaurant for lunch. The Giant’s Causeway is a natural phenomenon casued by a sudden volcanic eruption, 60 million years ago, that pushed molten basalt from the core of the earth to the surface. Because it cooled down rather quickly, it contracted and, in the process, formed straight columns that have perfectly even polygonal sides. These nest together in a sort of honeycomb at the water’s edge, washed by the thundering waves of the Atlantic. Of course, because Ireland is also full of local folklore, the story goes that an Irish giant named Finn McCool fell in love with a Scottish damsel named Nieve. To reach her easily, he built the Causeway. When Nieve’s love, the Scottish giant Oonagh, realized that Nieve had left him for Finn, he set out to claim her back. Finn was afraid of the consequences of a conflict as Oonagh was larger and stronger than he was. But the wily Nieve disguised Finn as a baby and instructed him to lie on his back on the bed. When Oonagh arrived in Ireland, Nieve informed him that she could not return with him to Scotland as she had just had Finn’s baby who, she pointed out, was asleep on the bed. When Oonagh saw the size of the ‘baby’, he panicked, wondering just how huge the father would be if the baby was so massive. He turned tail and returned to Scotland in such a hurry that he broke the causeway into pieces leaving only a few bits of it surviving today. David told us the story with relish and invited us to choose whichever version most appealed to our temperaments. The National Trust manages the Giant’s Causeway which has been ranked as one of the ten best free sights in the world. To get to the sight, however, you need to wind your way down a steep mountainside to reach the edge of the ocean. While making it down is manageable enough for most people, the climb upwards is steep and no picnic–at least not for those who do not exercise regularly. I was pleased to see a small coach called the Causeway Coaster coasting right past by and when I flagged it and asked the driver if I could hop one, he said, Sure, for a pound each way, I was welcome. Well, I was downhill in two shakes of a tail and before I knew it, the rain came down in sheets and it grew bitterly cold. Of course, this sudden dip in temperature had to happen at a time and in a place in which there was no where to shelter. Fortunately, I had my brolly in my pocket and I whipped it out smartly but it was no match against the ferocity of the wind. Then, I was taking pictures quickly of the vast basalt columns that form a natural wall on the hillside near a projecting mountain called the Aird’s Snout. When I had my share of this portion of the Causeway, I walked towards the bus stand and discovered that the other passegners on my coach had reached the shore. At this point, the hexagonal columns were most marked, their regularlity stunning in the visuals they presented. Though lapped by the waves and whipped by the wind, they created a startling effect on my senses as I took them all in. Some of them created mounds, like little hills, and we climbed and posed on these to take pictures. Others formed natural stone steps. Yet others spread out evenly towards the waves. The colors were also varied. Grey, black, even ochre, they are a wondrous sight and no matter how many pictures you might have seen of the phenomenon, it is still fascinating. Then, I was on the Coaster again, driving up to the summit where, at the gift store, I purchased a few postcards as souvenirs. All of us were ready for our meal by that point. We were hungry and more importantly, we were freezing. The Steak and Guinness Pie completely lived up to its promise. Portions seemed to have been created for Finn McCool and Oonagh–they were gigantic! I was able to eat heartily and have more than half of my plate packed up for my evening meal. Served with mashed potatoes, it was Irish comfort food at its best and we all ate well as we washed it down with glasses of Guinness–does anyone know why Guinness tastes so good in Ireland? 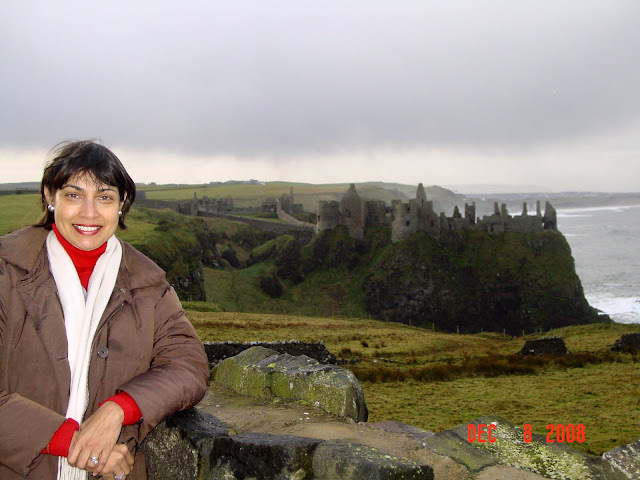 Then, we were on the coach again, heading further west along the coast to see the ruins of two castles–Dunsverick Castle of which only one sturdy wall remains at the water’s edge and the far more picturesque Dunluce Castle (lwft) of which many more ruins remain. We posed at both spots for pictures but did not venture any closer to the cliffs. As the coach moved on, we passed by other places of interest: White Rocks Beach with its surfers tumbling merrily on the crashing Atlantic waves below us, Bushmills–the town that is famous for procuring a license to brew whiskey from James I in 1609 and today offers tours and tastings in its distillery, Portrush, a pretty resort town that is perched on the cliffs. The countryside of Ireland was most soothing to my soul as we passed by myriad flocks of sheeps, all marked with bright spots of color to help identify them. The mountains were never far away from sight as the Mourne and the Sperrin Mountains came within view. David told us we could doze off for the next one hour until we reached Londonderry but the countryside held me spellbound and I was the only person on the bus wide awake as I took in the charms that only Ireland’s bucolic rural escapes can offer. To follow me on the next leg of my travels to Londonderry, please click on the link. 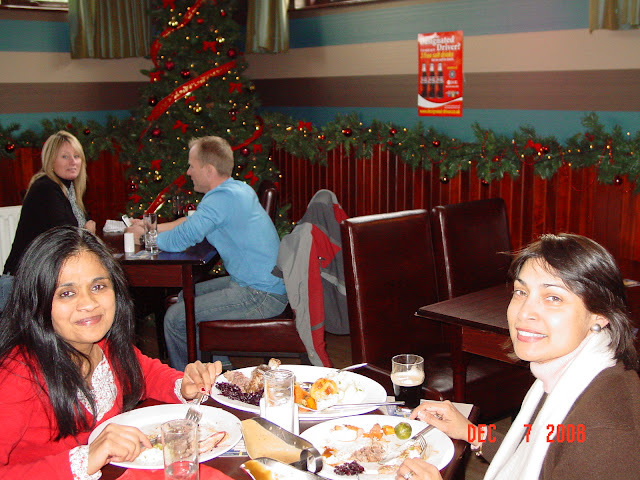 Ivy (nee Joseph) Ridge is a very close friend of my close friend Sunita (Sue) Pillai from Bombay. 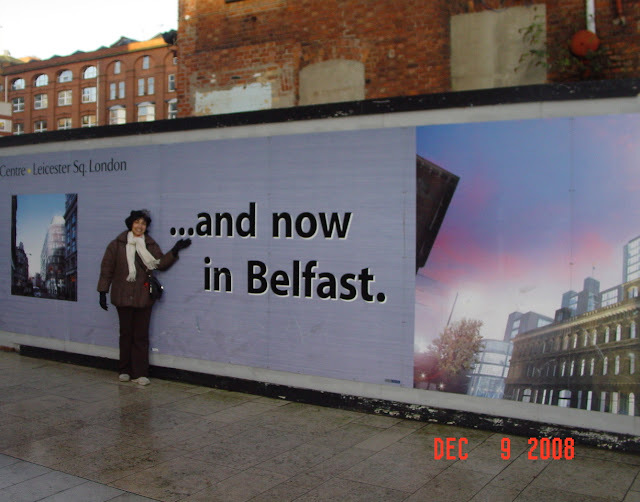 It was Sue who put me on to Ivy and when I emailed Ivy to let her know that I would soon be visiting Belfast, she responded promptly and warmly and told me that she would arrive at the Youth Hostel to pick me up and show me around her neighborhood. I was overwhelmed by her hospitality and, to my immense surprise, we both clicked instantly. It was as if we had known each other forever! At 11 am. on Sunday morning, Ivy arrived, as planned. I had eaten breakfast and had taken a walk around Great Victoria Street by the time she packed me off in her car and drove me along the beautiful Causeway Coast as it is known. Ivy has lived in Ireland for about 14 years and has grown to love the country immensely. Her husband Darryl is a Forest Officer…so it was only natural that she suggested we link up with him and her kids, Stephanie and Ryan in the forest. I was more than happy to place myself in her hands. Our first stop on the lovely coastal road was the 12th century Norman castle of Carrickfergus which stands on the very edge of the harbor as if guarding it from intruders. It is in a remarkable state of preservation and is extremely picturesque against the few colorful boats that bob in the harbor. Unfortunately, we were unable to enter it to explore the interior as it opened only at 2 pm on Sundays. Still, I was quite pleased with the pictures we took as the sun was out and despite the chilly wind that blew incessantly, the day didn’t seem dreary. This castle was visited by William III and a sculpture of him in pirate’s dress stands at the entrance. Miles of coastal road brought the magnificent drama of sea, waves, rocky promontories and beaches into view as we ate up the miles. As we passed the seaside villages of Gywnne and the larger port town of Larne, I was struck by the sheer beauty of the country. Ivy was an enthusiastic guide as she pointed out to me items of interest that I should not miss. Soon, we reached the little town of Ballygally (don’t you just love these Irish names?) where a castle haunted by a friendly ghost has been converted into a luxury hotel (left). Further north we drove through the harbor town of Glenarm where Ivy informed me that her husband Darryl owns a boat that is permanently moored here. In the summer, they are ardent sea farers, sailing to neighboring islands and enjoying the outdoors. As a forest officer, Darryl spends a great deal of time in the great outdoors and climbing, trekking, walking, hunting and fishing are his passions, interests which he shares with his kids. Before long, we were in Glennarif Forest Park where we were joined by the rest of the Ridge family. Then began one of the most memorable parts of my trip–a long and interesting trek through a forest trail that took us past gushing waterfalls and stunning autumnal scenery. There was dead fall on the paths and small patches of freshly fallen snow which made negotiating the pathway’s rather challenging, especially for those of us who did not have suitable footwear. Still, with a hand from Darryl and a lot of giggling from the kids, I managed well and as we climbed higher to the accompaniment of the thundering waters of the cascades, I felt as if I had left civilization far behind and allowed the arms of nature to embrace me completely. It was heavenly and I wished I could have stayed there forever. Unfortunately, night falls early and rapidly in these parts in winter and by 4. 30, we began to lose daylight. It was time to return homewards to Ivy’s home in Ballymena where, at her kitchen table, we warmed ourselves with large cups of tea. By 5. 30, I got up to leave and Ivy dropped me to Ballymena station from where I caught a train back to Belfast. In the company of two sweet Irish girls who were returning to the city after spending the weekend at their parents’ home in the country, I found myself back on Great Victoria Street making my way to the hostel. After a conversation with Llew, I joined up with my suite mates (Jaime from Malaysia and Jo and Lisa from New Zealand) for a drink at The Crown, a famed tavern that is run by the National Trust. There, over a half pint of Guinness, we got to know one another and talk about our travel adventures. An hour later, I was cozily tucked away in my bunk getting ready to pull the curtain down on another memorable day in Northern Ireland. 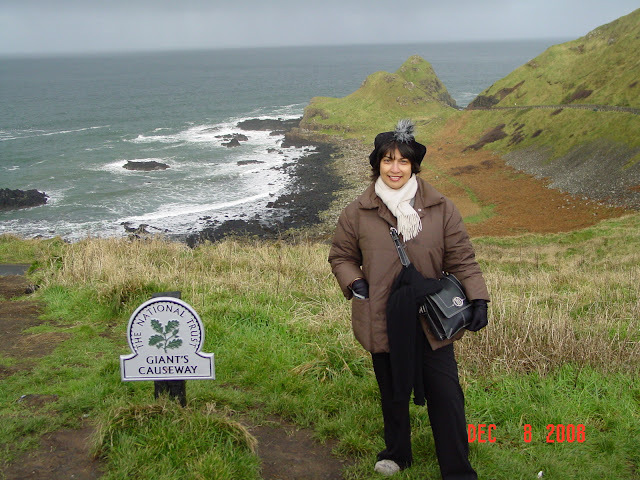 To follow me on the next leg of my travels to the Giant’s Causeway, please click on the link. I awoke to another dismal day. It was wet and it was cold–hardly the kind of weather in which one could go out joyfully to explore a city. Thanks to the Hop On Hop Off Bus, my day was saved in that I was actually able to salvage it. I purchased a ticket for 12 pounds from the Belfast Tourist Center and caught the 11 am bus–upper deck, front seat, of course! I enjoyed the tour so much, I took it twice for the same price, each time in a different bus with a different tour guide and I wasn’t bored! It was cold and my fingers ached. As the bus wound its way through the City Center towards the Alfred Clock Tower (named for Victoria’s beloved husband), I tried every way I could think of to warm them, but to no avail. Finally,I just sat on them and that did the trick! Commentary was provided by those Irish tour guides known for their wicked sense of humor. His name was Ivan and our driver was Ciaran. About six other people shared the bus with me. You could tell it was decidedly off-season. In fact, a few days previously,I had heard an Irishman comment upon a tourist who was lugging a suitcase through St. George Market: “Imagine a tourist coming to Belfast in the winter!” He clearly thought the lady was nuts. As I tried to get warm, I thought I was nuts too! Soon we were crossing the Lagan Weir and heading towards the ship-building yards of the renowned company known as Harland and Woolf that once ruled the world–or at least Ireland. Responsible for building some of the most famous ships in history–the Titanic, the Olympic, the Lusitania–they once employed 34,000 people. Their giant cranes, affectionately nicknamed Samson and Goliath, tower above the city’s skyline, a silent reminder of the glory that once was navigation. Today, they linger idly waiting to be restored to, as some have suggested, a five star restaurant! At the deserted dry docks, we saw the Pump Room close to where the Titanic was once docked as she went through the final stages of construction and decoration. Though many cities host Titanic exhibitions today (Liverpool, for one), Belfast claims that this honor should go to her alone as the ship was fine when she left Irish shores! On to Stormont (left) , a massive mansion made of Portland Stone that sits on a hill approached by a mile-long alley lined with lime trees–one for each of the workers who built it. 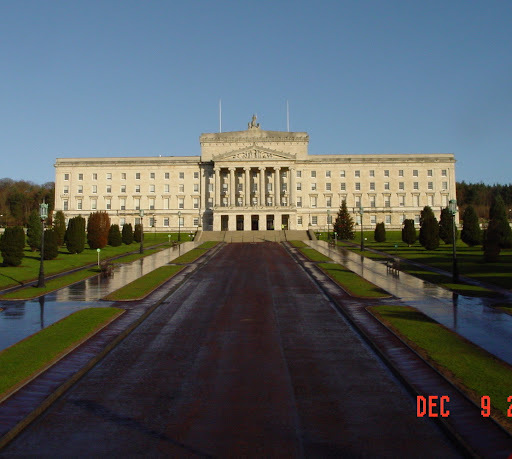 This is Northern Ireland’s Parliament Building where affairs of state are still debated and laws passed. The area around it is elite, with lovely terraced housing and the campus of Campbell College not too far away. Then, it was time to enter the most notorious parts of Belfast, known for the infamous strife between Protestants and Catholics that kept the country in a state of high tension through most of the 70s and well into contemporary times. The bus took us through Shanklin Road, Protestant stronghold, where all the fallen sons of the Loyalists are remembered in large size murals painted on the sides of the houses and stores that line the narrow streets. We passed through the Court House where the scales of Justice are missing from the hands of the Goddess perched on the pediment. They turned up recently on ebay! Right across the street is the Crumblin Jail, a tunnel linking the two buildings underground. Some of the most notorious political prisoners were held in this jail which today is used only as a memorial to the country’s troubled history. In the distance, the guide pointed out a Linen Factory, another remnant of Irish history that has gone with the wind. Once the mainstay of the economy, the creation of linen from flax is a long and laborious process and involves a great deal of manual work. No wonder the industry fell by the wayside as synthetics flooded the market. Today, it serves only the luxury market and a few consumers able to pay the vast sums it costs to make the fabric wearable. I know that I will never look at linen again without appreciating the time and trouble that went into its creation. 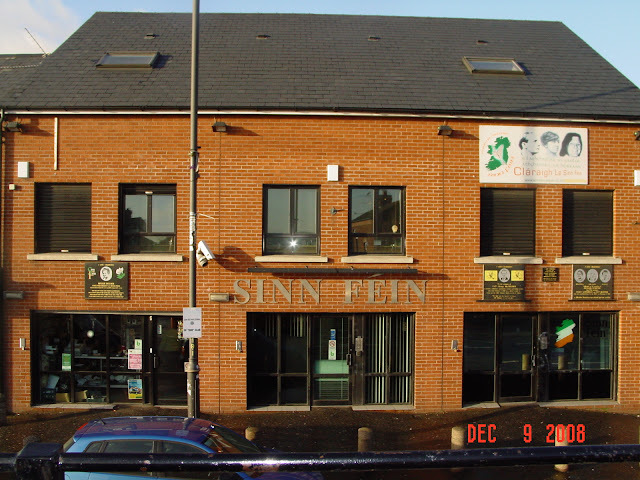 On Falls Road, we saw the other ugly side of religious warfare–this is the Catholic side, home of the IRA or the Irish Republican Army manifested in the offices of Sinn Fein (left) that sits on a rather nondescript street in a modest brick red building. This was the place that Bill Clinton visited in his attempts to broker a peace agreement with Gerry Adams. The Peace Agreement is holding tenuously (so far, so good, everyone says, but they’re clearly not holding their breath!) as seen in the ease with which one can now travel from the Protestant to the Catholic side. The Peace Wall still stands, though, dividing the town and the people. It snakes around the residential streets in brick red decorated with a few black details. The murals here remember the Catholic martyrs such as Bobby Sands who starved himself to death in the Thatcherite era to gain dignity for political prisoners held in British jails. 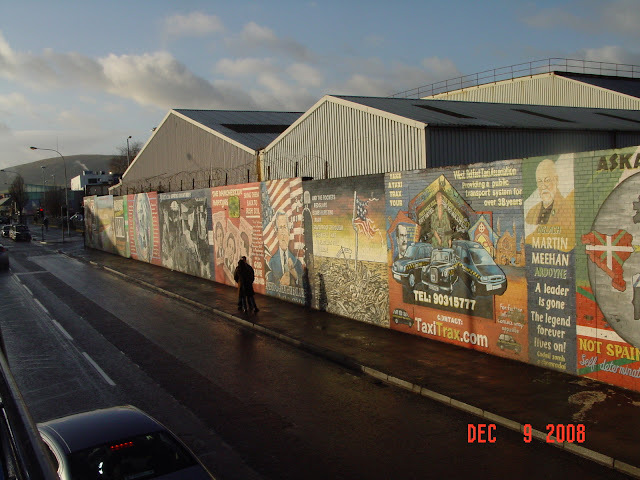 There are other murals–loads of them–featuring Bush sucking away all the oil from Iraq and reproductions of Picasso’s Guernica. The people of Northern Ireland are passionate about their politics–I will say that much. No wonder so many of them came to America where they entered politics. No less than 23 American presidents can trace their roots to Ireland including, of course, the most famous of them all, the Kennedy clan! 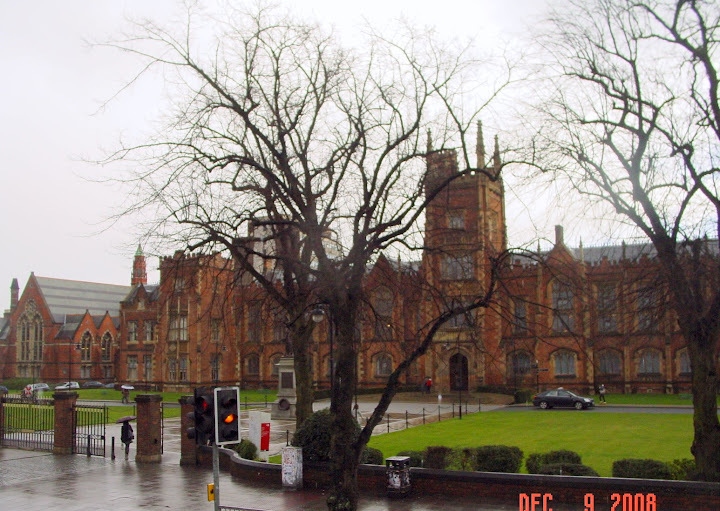 We passed through Queens University next (left) , the educational institution that produced Literature Nobel Laureate Seamus Heany whose portrait, together with several others, adorns the walls of the Great Hall inside. Built by Charles Langdon in imitation of Magdalen College, Oxford, this red brick Tudor building brings tremendous dignity to Queens Quarter with its funky clubs, lively restaurants and smoky taverns. Indeed, Belfast is known for its historic pubs and I downed a swift half in two of them: Magner’s Irish cider in Robinson’s and Guinness in the Crown Tavern, that sit cheek by jowl on Great Victoria Street. The latter is a confection of Victorian embossed tiles and a plasterwork ceiling, mirrors and carved counters and booths–the most ornate of the country’s pubs. No wonder it is managed today by the National Trust–one of only two pubs that the Trust runs. Of course, we passed the bastion of the City Hall (left), built in the manner of St. Paul’s Cathedral, with a towering dome and the statue of the Queen looking glumly over her city. Near at hand is Belfast’s newest attraction–the Wheel–a huge ferris wheel that provides good views of the city. Not that it would work on a foggy day and there are many of those in Ireland! In the City Center, there are churches and cathedrals and shopping malls of which the city is very proud indeed. In these days of credit crunches, the streets were still thick with shoppers who found relief in the Continental Market being held in the grounds of the City Hall where shoppers could feast on everything European from French crepes and baguettes to Spanish paella, from Greek mezes to German marzipan. There was also a carousel and games of skill to add to the festive revelry. I took the bus tour twice. It was the only way to escape the cold and receive a bird’s eye view of the city at the same time while being entertained by the tour guides whose humor never faltered. I spent an hour browsing through books on Ireland at W.H. Smith and sipped Ginger and Ginseng tea in the tea rooms of Marks and Spencer where I also indulged in a warm mince pie! I stopped to appreciate the attempts to instill holiday cheer through music as a lone accordionist from Romania named Fernando played Jingle Bells outside Clarks from where I purchased two pairs of shoes at bargain prices! Alas, people were too frenzied filling their stockings to support his attempts to make an honest living in the midst of his poverty. Visiting Belfast at Christmas might have been idiotic in terms of the weather, but it offered me a glimpse into the holiday spirit of a city that is slowly recovering from its decades, if not centuries, of religious war mongering and trying to extend a hand of friendship towards diversity. Harmony, the Ring of Thanksgiving, a sculpture that towers above the weir, is a testimony to the possibilities of friendship. Belfast has none of the gaiety of Dublin. I realized that almost immediately. It still seems to be covered under the dark shroud of doubt and religious famaticism and though it is making frantic attempts to be respectful of religious difference, I found that it lacked the kind of happy and joyous spirit that the Republic of Ireland seems to possess so effortlessly. 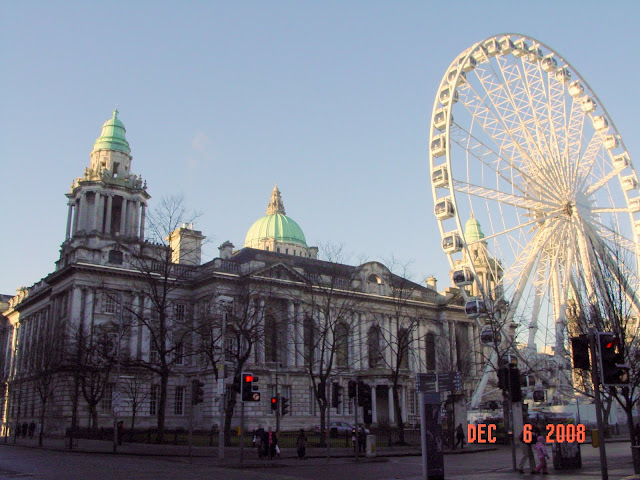 Of the two major cities, I found Dublin infinitely ‘happier’ but I am glad I visited Belfast. I achieved an understanding of the kind of harm that radical relgiious politics can do as well as saw for myself how difficult it is to recover from such dogmatism when one has made it a way of life. To follow me on the next leg of my travels along the Antrim Coast, please click on Carrickfergus. 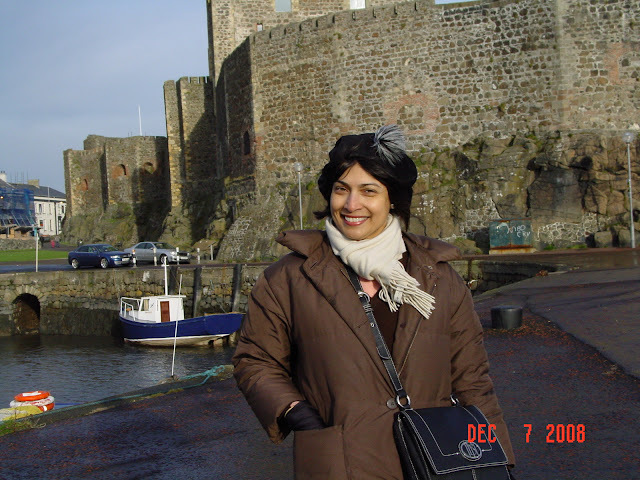 I arrived alone in Northern Ireland in December 2008, at a time that was very cold and very bleak. I had been spending a year in London and did not want to return to the USA without visiting Northern Ireland, a place I knew only through its political and religious notoriety. I was curious to see for myself the extent to which decades, if not centuries, of strife had burned themselves into the country and its culture and into the temperament of the people. Would they, for instance, be as warm, friendly and hospitable as their southern counterparts? Did they share that passion for music and humor and bars and bon homie that their neighbors knew so well? How had their squabbles affected the landscape and the mood, both in the cities and in the countryside? This was what I intended to discover first-hand in the few days I spent as I traveled from Belfast, along the Causeway Coast towards the Giant’s Causeway and the Glens and Forests of Antrim and finally in Londonderry. The trip was an eye-opener for me and a way to enlighten myself about a region of the world that captured the public imagination and hogged media attention for years. I found Nothern Ireland very different from the Southern portion. There was none of the gaiety of spirit that is everywhere in the South. Though I clearly was in Ireland, the Englishness of the space is very evident. There is an indefinable spirit in the region that is common to say, London or Edinburgh but not Dublin or Galway. I don’t know if I imagined this, but I found a rather dour pervasiveness about the areas I visited. Of course, Northern Ireland is as beautiful as its southern counterpart. In fact, the line of demarcation eludes the countryside where emerald fields merge seamlessly from south to north in a pattern that is repetitive but pleasing in its simplicity and charm–flocks of placid sheep, white washed farm houses, hedges separating land holdings, towering cliffs that cling tenaciously to foamy shores lapped by ferocious waves and rocky coves and bays often prettifed by rustic craft that bob in rural waters. I enjoyed this element of Northern Ireland a great deal. It was the cities that troubled me for they still harbor ghosts of the country’s troubled past. Evidence of brutal loss, ancient and more recent, is emblazoned upon the walls in larger-than-life sized murals that speak of the pain and suffering of a people who still consider their voices suppressed. 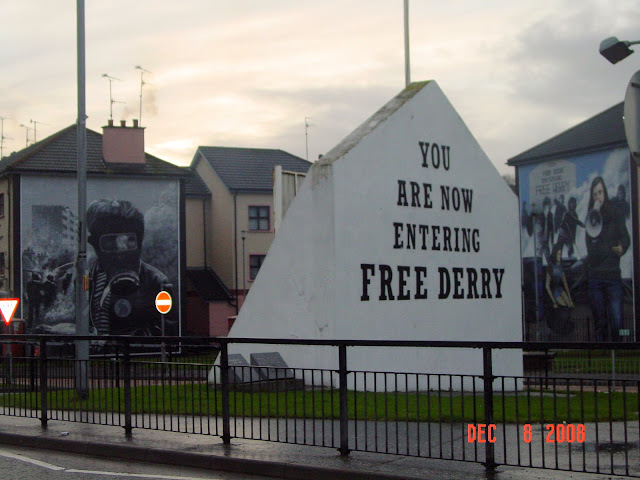 In Derry, for instance and in Belfast, parts of the city are separated in tangible terms by walls that might call themselves ‘Peace Walls’ today but were once raised to separate Protestant from Catholic, Loyalist from Rebel. The mood of gloom is definitely in evidence here as is the defaince in the tone of the guides who give tours and espouse their brand of radical ideology. It is disturbing even today when a tenuous peace agreement is in place. It was this Northern Ireland that I found problematic. It was this atmosphere from which I found it hard to escape though I sought comfort in historic bars and retail therapy in designer stores. Northern Ireland is trying hard to resurrect itself from the years of strife that embattled it. Though travelers are returning today and the government is attempting to heal raw wounds, I do believe that it will be a while before all vestiges of age-old rancour can be completely wiped out.